On December 10, 2015, the day he signed the Every Student Succeeds Act (ESSA) into law, President Barack Obama praised the bill, saying “I’m proud to sign a law that’s going to make sure that every student is prepared to succeed in the 21st century.” ESSA did provide a much-needed upgrade to the nation’s largest K-12 education program, adopting measures to ensure all learners would be prepared for success. But now that the first 16 states and D.C. have submitted their ESSA plans for review, are they taking full advantage of the opportunities to prepare students for life after high school? 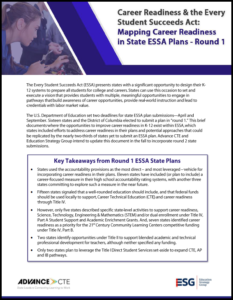 Today Advance CTE and the Education Strategy Group released a new brief examining where and how career readiness shows up in the first 17 ESSA plans. The brief finds that, while more than half plan to adopt measures of career readiness in their accountability systems, many states missed an opportunity to fully leverage ESSA to advance a statewide vision of career readiness. The primary area where career readiness shows up in round 1 ESSA plans is in state accountability systems. Under ESSA, state leaders have broad flexibility to identify the appropriate metrics and methodology to hold schools accountable for student success. Specifically, ESSA’s fifth indicator, a state-selected measure of “school quality or student success,” enables states to innovate in selecting a measure that best values their priorities. Among other measures, states were encouraged to examine advanced coursework and postsecondary success. In total, 11 out of the first 17 submitted plans identified at least one measure of career readiness in their accountability systems. In Nevada, for example, the state plans to measure the number of students completing postsecondary pathway options such as Advanced Placement, International Baccalaureate or industry-aligned and state board-approved credentials. North Dakota, on the other hand, aims to track the number of students graduating “choice-ready,” or prepared for success in college, military or the workforce. The state’s career ready pathway identifies students who complete certain career preparation activities — including work-based learning, Career Technical Education (CTE) pathway completion and industry credential attainment — on top of core academic achievements. Yet, when it came to other areas of the law, many states missed the opportunity to further a statewide vision for career readiness. Despite what they said in their goals and accountability systems, many state plans were light on details about how they would support local districts to advance career readiness. Only five states identified state-level activities under Title IV, Part A (Student Support and Academic Enrichment Grants) to support career readiness, STEM (Science, Technology, Engineering and Mathematics) and/or dual enrollment. These included Connecticut, which plans to provide technical assistance to districts building new CTE pathways and increasing work-based learning opportunities, and Nevada, which plans to braid funding across Title programs to help districts engage families and facilitate a deeper understanding of a well-rounded education, including enrollment in advanced coursework such as CTE. (Most states listed CTE and other strategies as a state support for well-rounded education, but fell short of describing how ESSA would be used to expand these strategies). Needless to stay, there is still time to promote career readiness through implementation. In the spirit of flexibility, the U.S. Department of Education’s requirements for ESSA plan submissions were incredibly tolerant, allowing states to describe in loose terms how they planned to implement the law. While state plans were light on details, supporting career preparation was a major theme surfaced through many states’ stakeholder engagement. It is possible that state leaders will yet be responsive to this feedback and find ways to strengthen career readiness beyond accountability. For the 34 states planning to submit their plans in September, now is the time to ensure career readiness is prioritized. ESSA was designed to create space and flexibility for states to advance their own needs and priorities. But if it is truly going to prepare all students for success in the 21st century, states must maximize every opportunity to connect ESSA to their statewide vision for career readiness. For more, join Advance CTE on July 20 for a webinar unpacking trends from the brief and highlighting strategies to leverage ESSA in support of career readiness. The webinar, titled Connecting ESSA to Your State’s Vision for Career Readiness, will take place from 1-2pm ET. Register here. This entry was posted on Thursday, July 6th, 2017 at 6:00 am	and is filed under Public Policy, Publications, Resources, Webinars. You can follow any responses to this entry through the RSS 2.0 feed. Both comments and pings are currently closed.